The automobile is a major nonnatural source of hydrocarbons in the atmosphere. The photochemical reactions of its gasoline and exhaust gases is an important source of an array of atmospheric oxidants that cause eye irritation and other problems for animals and plants (Section 5.3). Automotive air pollution is caused by the evaporation of gasoline or by tailpipe emissions. Gasoline evaporation occurs during the filling of the gas tank, and by the heating and cooling the automobile, as a result of diurnal temperature changes, and by operating the vehicle. In California and other areas of the country, vapor recovery systems connected to the gas tank collect the vapor displaced when it is filled. The displaced hydrocarbons are captured in canisters of activated carbon and later released into the engine during operation of the vehicle. Tailpipe emissions from automobiles have been reduced significantly as a result of federal legislation, and this has resulted in a significant increase in air quality (Chapter 5). In 1968 the federal government decided to control automobile emissions by imposing standards for new cars (Table 6-3). It was assumed that older cars that did not meet the emission standards would eventually wear out and be taken off the road. The allowed emissions for new cars were continually lowered until 1981, and were unchanged during the 1981-1993 time period. Emission standards were further lowered starting in 1994. The legislated emissions from new cars were decreased by more than a factor of 10 between 1968 and 1994, and these reductions resulted in a decrease in air pollutants (Table 6-4). The most difficult source of emissions to control is that from the exhaust pipe. This is because the internal combustion engine, as it is presently designed, will always emit some noncombusted hydrocarbons. The main source of these hydrocarbons is "wall quench" in the engine. The burning of the gasoline close to the walls of the cylinder is quenched because the zone next to the wall is much cooler than the combustion zone in the center of the cylinder. This relatively cold area slows the rate of combustion so that the hydrocarbons in this region are swept out by the piston before combustion is complete. 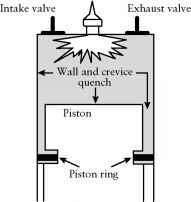 Wall quench also occurs in the crevice above the piston rings between the cylinder wall and the piston (Figure 6-11). a Average values before legislation. Emissions of NO* increased with control of HCs and CO. There was no NO, standard at that time. Source: Adapted from J. G. Calvert, J. B. Heywood, R. F. Sawyer and J. H. Seinfeld, Science, 261, 37-44 (1993). Source: Council on Environmental Quality, 22nd Annual Report, Washington, DC, March 22, 1992, p. 10, and Chem. Eng. News, pp. 22-23, Jan. 6, 1997. FIGURE 6-11 Regions of wall and crevice quench in the cylinder of a four-stroke cycle internal combustion engine. 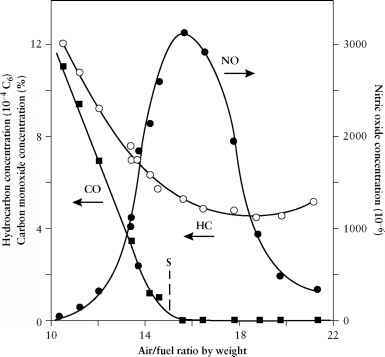 FIGURE 6-12 Effect of air/fuel ratio on hydrocarbon (HC), carbon monoxide (CO), and nitric oxide (NO) exhaust emissions; S, stoichometric operation. Redrawn from W. Agnew, Proc. R. Soc. Ser. A. 307, 153 (1968). Used by permission of The Royal Society of Chemistry. 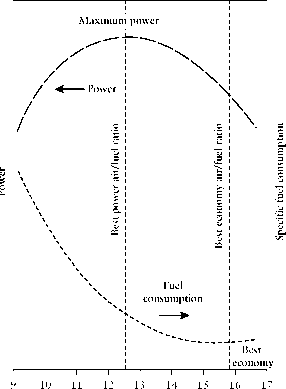 FIGURE 6-13 Effect of air/fuel ratio on power and economy. Redrawn from W. Agnew, Proc. R. Soc. Ser. A. 307, 153 (1968). Used by permission of The Royal Society of Chemistry. temperature of the combustion zone in the engine in the presence of more oxygen. Automobiles that travel farther on a gallon of gasoline are less polluting. In addition, they conserve valuable fuel resources. In 1978 the U.S. government instituted a program setting an average mileage goal for the fleet of cars manufactured by the major automobile companies. This corporate average fuel economy (CAFE) was gradually increased from 18 miles per gallon (mpg) in 1978 to 27.5 mpg in 1985. The U.S. Congress and presidents have been unwilling to increase the CAFE since 1985 because of concerns regarding the increased cost of the high mileage automobiles, and because the lighter cars that would have to be used might not protect their occupants in collisions as well as heavier vehicles. Environmental groups claim that the technology is available to produce a fleet of cars that average 45mpg, but there is strong resistance to such a mandated increase from automobile manufacturers. The environmentalists were correct, since both conventional and hybrid gasoline-electric cars with mileage in the 40-50 mpg range were introduced in the United States in 2000. Since the internal combustion engine, as presently designed, cannot operate without producing emissions, some device must be added to the automobile if both NO* and hydrocarbon and carbon monoxide emissions are to be controlled. In 1973 recirculation of the exhaust gases was introduced to help control NO* emissions. In addition, in some cars air was injected into the hot exhaust gases to facilitate continued oxidation of hydrocarbons. 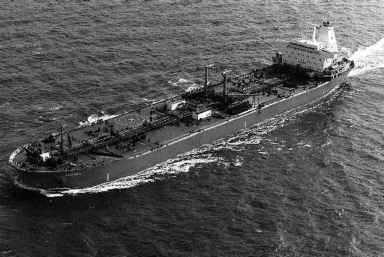 In 1975 in the United States, 85% of the new cars sold were equipped with a catalytic reactor in the exhaust stream to catalyze the oxidation of CO and hydrocarbons. Lead added to gasoline poisons the catalysts in the catalytic converter; therefore, starting with the 1975 models, all cars equipped with a catalytic converter were required to use lead-free gasoline.